Monstergalaxy COSMOS-AzTEC-1 observed with the ALMA telescope in Chile. 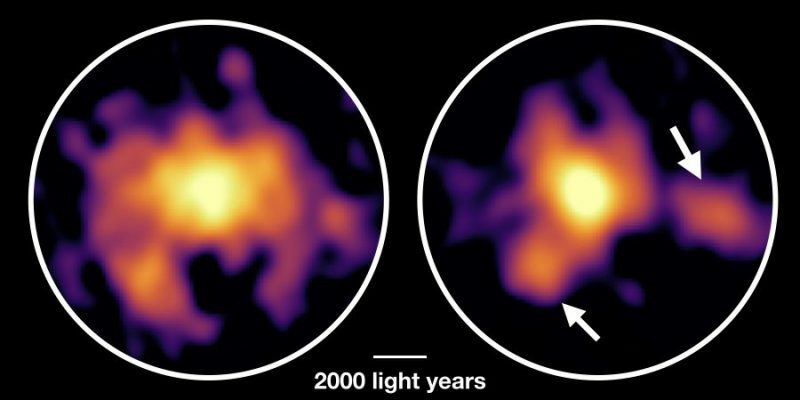 ALMA showed the distribution of molecular gas (left) and dust particles (right). In addition to the dense cloud in the middle, the research team found two dense clouds several thousand light-years from the center. These dense clouds are dynamically unstable and are considered to be places of intense star formation. 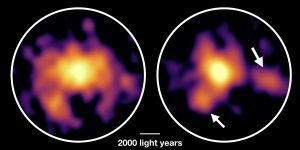 Picture on ALMA (ESO / NAOJ / NRAO), Tadaki et al. 00 times faster than in our own Milky Way galaxy. 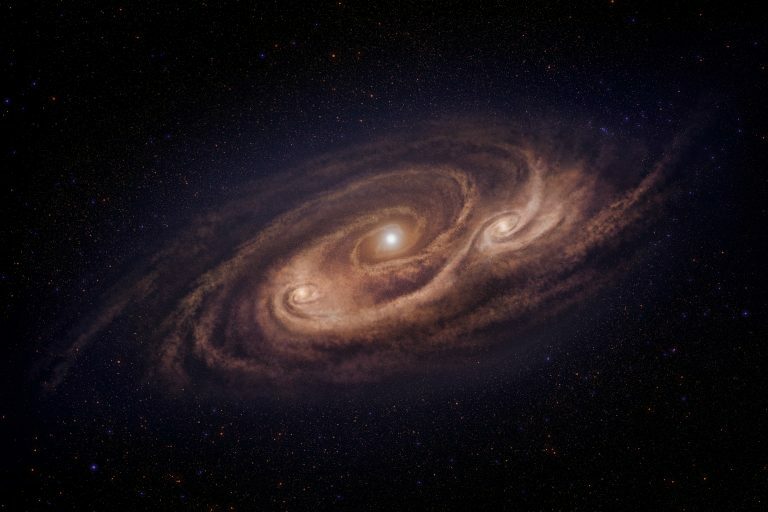 But a newly mapped starburst galaxy called COSMOS-AzTEC-1, which is 12.4 billion light-years away in the early universe, is now known to make 1,000 times faster stars than our Milky Way galaxy. It has also been found that the star formation areas are not located in its galactic center, but in huge clouds that are located several thousand light-years outside the center. In fact, this galaxy is a dynamic and mysterious place, so much so that the astronomers who studied it called it an unstoppable monster. Of course it is not really unstoppable. Stars are formed of gas and dust in a galaxy, and starburst galaxies consume their gas and dust faster than normal galaxies like our Milky Way galaxy. As the gas and dust decrease, star formation slows down. A real surprise is that this galaxy, seen nearly 13 billion years ago, has a massive, orderly gas disk that is in regular rotation rather than what we expected, which had been a kind of disorderly train crash would have the most theoretical studies had predicted. 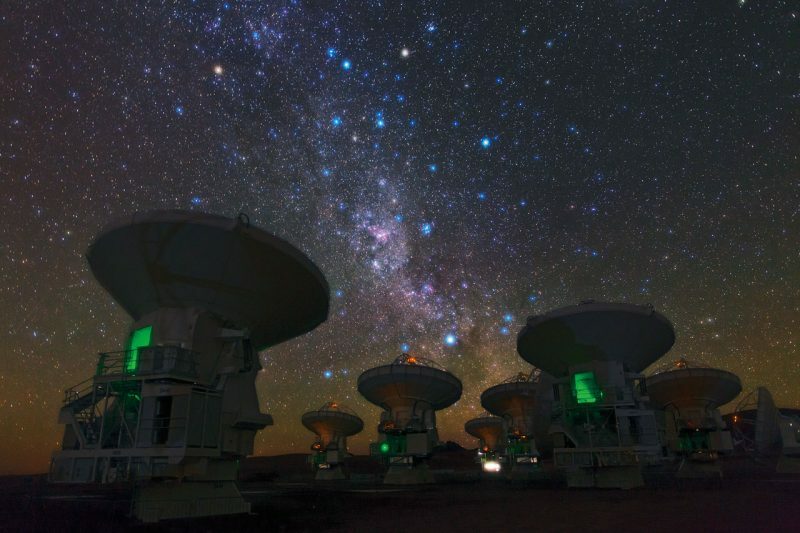 He said the new observations – made in the Atacama Large Millimeter / Submillimeter Array (ALMA) in northern Chile – show that this gas disc is now dynamically unstable . That is, the entire gas disk that makes up this galaxy splinters and goes through a gigantic episode of Starburst, more than a thousand times our Milky Way galaxy. We found out that there are two different big clouds several thousand light-years from the center [of the galaxy COSMOS-AzTEC-1]. In the most distant starburst galaxies, stars are actively formed in the center. Therefore, it is surprising to find off-center clouds. Tadaki, Yun and the team used the ALMA data to create detailed maps of molecular clouds, which are the clouds of gas and dust in which new stars are born. They found that COSMOS-AzTEC-1 was rich in star content, but it was still difficult to figure out the nature of the cosmic gas in the galaxy. They said that they used the high resolution and high sensitivity of ALMA to observe the galaxy and obtain a detailed map of the distribution and movement of the gas. They said it was the highest resolution – that is, the sharpest and clearest – molecular gas card of a distant monster galaxy ever made. How these galaxies were able to collect such a large amount of gas and then essentially the entire gas reservoir into stars At the moment cosmologically it was a completely unknown question that we could only speculate about. 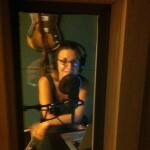 We now have the first answers. The team estimates that the gas in COSMOS-AzTEC-1 is completely consumed in 100 million years, which is 10 times faster than in other star-forming galaxies. Conclusion: The monster or starburst galaxy COSMOS-AzTEC-1 now has two huge star-forming lobes outside the galaxy. It is known that it produces stars 1000 times faster than our Milky Way.